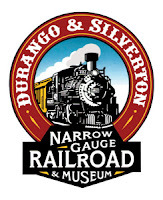 Durango & Silverton Narrow Gauge Railroad, headquartered in Durango, Colorado, is offering a rare deal for vacationers this summer and has several events planned. Durango, a town that's never really shed it's wild west image, is an amazing place to fall in love with narrow gauge, steam railroading. It's worth the travel time to get there, and if you're really brave, you'll bring your camera but leave your laptop and smartphone charging at home. Unplugging with only a hotel phone for emergencies may be the 2011 way of "roughing it," for some folks. I know that for me, doing so would certainly add to the old west, frontier feel! 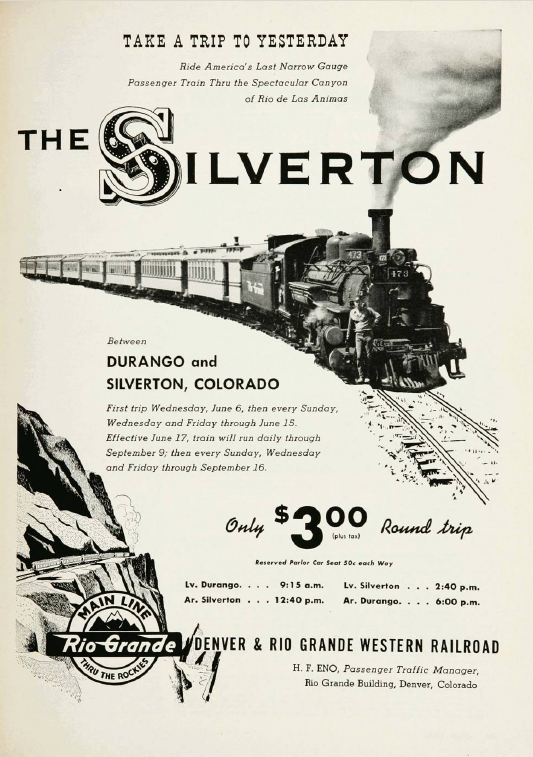 "The Silverton," as it's been marketed for at least 55 years (see ad, left) is perhaps the most revered, most famous heritage railroad in North America, if not the world. Its squat, soot black locomotives and bright "aspen gold" coaches have carried generations over the 45 miles between Durango and its namesake. For more than 125 years, passengers have gaped at the drop from the high line above the Animas River, smelled the fresh mountain air mingled with coal smoke, listened to the water tumble over the rocks, and rocked gently in their seats with the gentle rhythm of the cars as they travel unhurried by a day's travel. Fares $83.00 Adult (ages 12 & over) and $49.00 Child (ages 4-11). Fares are subject to 4% Historic Preservation Fee. Bus fares are not included in this offer and are an additional fee. Additional restrictions apply and seating is limited. Call 888-872-4607 (888-TRAIN-07) to book tickets. Again, that's how I understand it. Take some advice from someone who has ridden with a small child: When we arrived at Silverton, I wanted to spring for the bus tickets after I had ridden the few hours to Silverton with a younger child (age 4) who did not have the stamina to ride all the way back to Durango. As a dad, I'd encourage you to judge wisely and have the courage to buy the bus trip back if you think your kids won't make it through an 8-10 hour experience. Better to leave them still hungry for trains than to have them tired and trapped on a train they have no desire to be on. My next trip aboard the Silverton will be in an open gondola (option 2 above). This does not mean that you would be sitting or standing without a roof, like passengers on the Cumbres & Toltec Scenic have access to the open gondola. It means you have a seat reserved in a covered gondola, which has more exposure (open air) than the coaches. If you're a shutterbug like me, you'll appreciate that. On the other hand, I'm going to bring a few blankets to keep warm. Even in the middle of the summer, the first few hours of the morning in the mountains feels much colder to a lot of folks. Beside such a great deal, there are several steam specials as well. Things are happening in Durango! 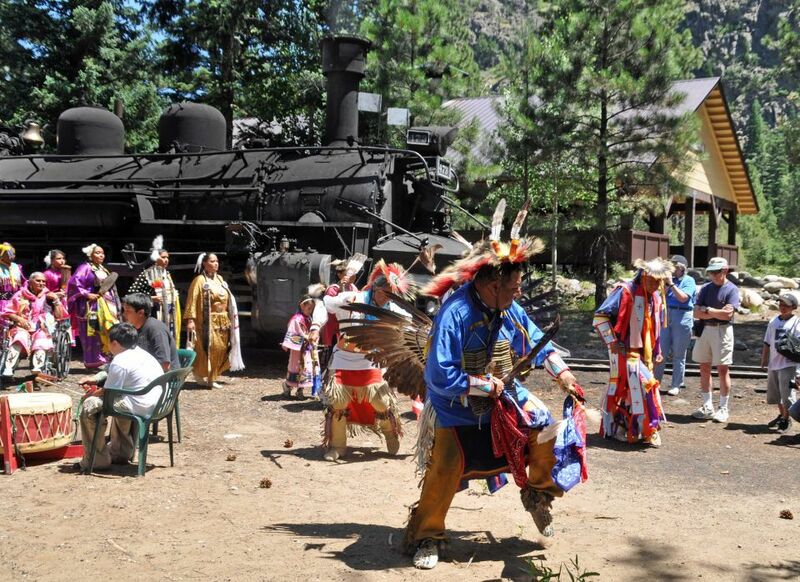 2011 Native American Heritage Train - June 5 @ 10:15 AM, "...travel 26 miles to Cascade Canyon along the Animas River and into the wilderness of the San Juan National Forest. Elders from the tribe will ride in the San Juan Car to share traditional stories along the way. Native dancers will travel through Standard Class cars to greet and visit with passengers.You will be greeted at Cascade Canyon by members of the Southern Ute Tribe for a Native American dance ceremony accompanied by drummers and singers. After the ceremony and dancing there will be time to explore the wilderness at Cascade Canyon before returning to Durango." Fares: $79 adult, $49 child (ages 4-11) Standard Class, San Juan Car $99 (any age) Deluxe-Class, and, as usual, separate charges apply. 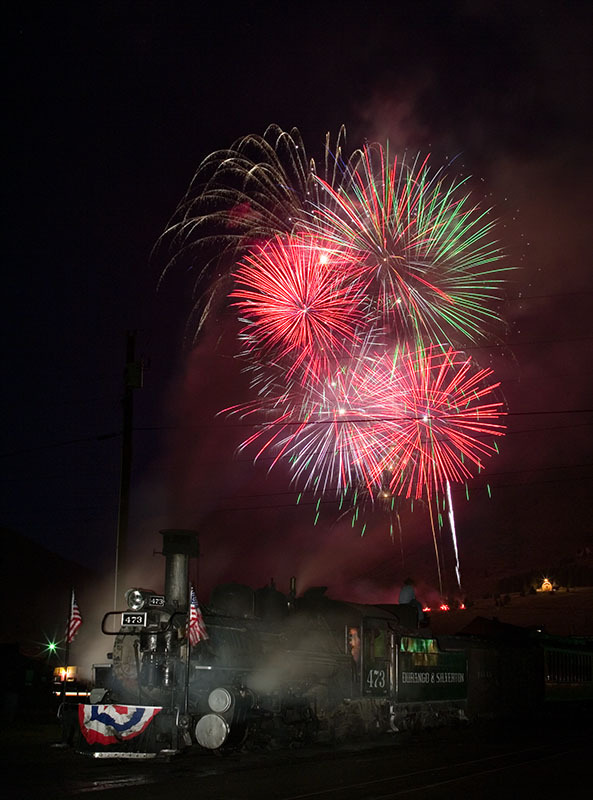 Independence Day Express - July 4 "Celebrate America’s birthday riding the Independence Day Express where you can enjoy the afternoon festivities in Silverton and stay for one of the largest fireworks display on the Western Slope! 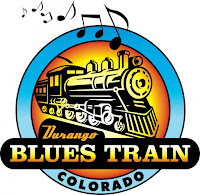 After the fireworks are over, relax and enjoy a rare late-night trip by train back to Durango! This train package includes live music and a barbeque under the tent next to the Silverton Depot" No price or time listed yet. Call 1-888-TRAIN-07 for the latest details. Railfest 2011 - August 18-21, "Our 13th Annual Railfest celebrates railroads and the men & women who work them. This 4-day weekend will feature the Eureka & Palisade #4, RGS Goose #5, special train events, and a World Fast Draw competition." Details still pending. Of note, the first Railfest in 1999 was a rainy affair. I still am amazed that I blundered into it, a railfan completely unaware of the first-ever Railfest until I arrived at Silverton the same weekend and was stunned to see the Eureka 4-4-0 (seen above) pulling in a few minutes after I arrived. It was followed by Rio Grande Southern Goose #5, only recently restored to service from Dolores, CO. Seeing them, despite the rain or maybe because of it, makes my memories of that trip especially sweet. Fall Colors trains - September 24 & 25, "Transport yourself back to 1926 and re-live the autumn splendor of the Animas Canyon on this historic re-creation of railroading in the glory years of the Rio Grande’s Silverton Branch operations. A locomotive and all rolling stock will be lettered to represent this era. ... This will be the final public appearance of the Pullman Green consist for photo specials." Fares start at $169 per day. Different consists on the two days are currently planned and there's a 10% discount if you book both days. Book using the link or calling 970-247-2733 or 888-TRAIN-07. I've heard others tell of a great time on these specials. Above all, Durango is an amazing place to visit, even if you aren't narrow(-gauge)-minded. It's a neat train with a fascinating history, but the town is just as fascinating in it's history and what it has to offer. Folks at Durango.org and DurangoMountainResort.com have a few ideas they'd love to share with you. 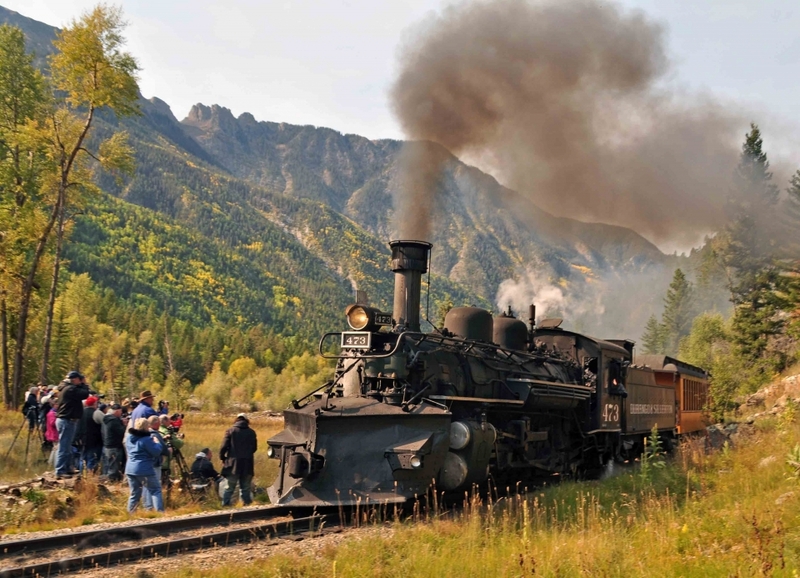 Great information about the Durango-Silverton train ride. I agree with you on several points. I have done both the open gandola and the closed car. I really enjoyed the open car as long as you plan for it! Layering will be good! Also the advice for the bus trip back may be helpful for older folks too. I was with a older person whom was "antsy" on the way back and would have preferred to take the bus back. Personnally, I couldn't get enough of the train ride and scenery...I could have done it again the next day! Thanks for putting your time into this blog...I know it takes a lot of work to blog! Pam, great point about layering! Even in the dead of summer, a sudden thundershower and everyone's freezing! I can't get enough of it either. I really love the Silverton train! Thanks for your comments!